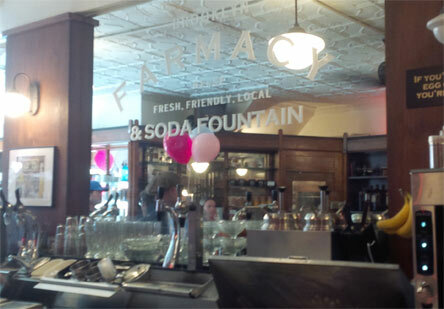 [Nick in New York City #4] ‎Within walking distance of Milkmade's new shop is Brooklyn Farmacy & Soda Fountain. They were actually celebrating their 5th anniversary when I stopped in. BF is your classic soda fountain brought to life in the present day. Walking in, it's as if you've been transported back in time. The decor is all very retro and honestly, I could feel the nostalgia going on from some of the older customers at the shop. It's definitely something to take in. 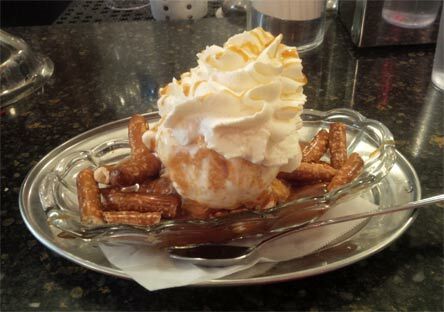 ‎This one combines vanilla ice cream, warm caramel sauce, broken pretzel rods and whipped cream. The sundaes are almost as pretty as the ones I make. All of their toppings are homemade and that caramel sauce is delicious. Thick, gooey and buttery sweet perfection. I'm glad they went with a traditional caramel over a salted one because you get enough saltiness from the pretzels. These pretzels are fresh, crunchy and compliment the sauce. Throw in the quality vanilla ice cream from Adirondack and fresh whipped cream and you have a winner to me. It's gets the job done and solves any sweet and salty cravings you're having. 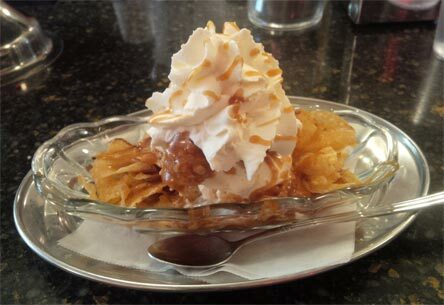 This one combines the same vanilla ice cream and caramel sauce with Long I‎sland's North Folk Potato Chips and their house made Peanut Butter. This sundae was originally a Father's day exclusive but I can see why it's on the menu full time because this is something that will blow your mind. First off, the Farmecy peanut butter is one of the greatest toppings I've ever had. When I die, fill my grave with this peanut butter, please. It's filled with peanut chunks and is just awesome on top of awesomeness. I believe they sell it in jars, and if so, I need to use it on some of my own sundaes. The potato chips take it up a level and makes it the best salty sweet dessert I have ever had. If you're in the area, you need to stop here for this sundae. While eating the sundaes, Gia (one of the owners) sent her brother, Peter (the other owner) over to us to tell us stories. I wound up showing him my sundae project and he came across a sundae in which I used reese's pb cups on and jokingly called me a cheater for using them. Then he went and made a baby version of their Peanut Butter Cup Sundae which uses that awesome peanut butter sauce and coffee ice cream. You know what? It tasted exactly like a peanut butter cup and once again proved to me peanut butter and coffee are a great duo. Then I tried pitching him a fluffernutter sundae in which he thought chocolate ice cream would work better and then forced me and my friend to try them side by side in which the vanilla was clearly the better one and he decided against the idea. I think he was honestly just trying to fatten me and my friend up. Lastly, he was in the process of making a sundae that sounds like summer to him. Mint chip ice cream, fluff, watermelon and blueberries. Sounds awful right? Yeah, that's what I thought and was thankful his watermelon went bad. Except out of nowhere he returns with a new container of watermelon 5 minutes later and made the sundae. It actually worked. Don't ask me how but it worked. This guy is crazy and I like it. This whole soda fountain is worth a visit when you're in the city. Not just for the food but for the atmosphere. Thanks again to the whole Brooklyn Farmacy crew for having me in and for the great time. I know I'll be back to try some more sundaes and a shake or two! Please Note: Thanks to Brooklyn Farmacy for providing Nick with these free samples. I've seen this place highlighted in "Unique Sweets" on television. I remember seeing the segment that featured the sundae with potato chips, peanut butter, caramel sauce, and vanilla ice cream and thinking how awesome that sounds with all the saltiness and sweetness going on. It sort of reminds me of B&J's departed Late Night Snack but I can only assume it's better than that. 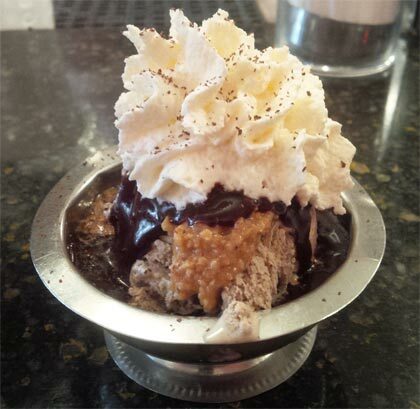 Thanks for sharing your visit and letting us know that this place and that particular sundae are the real deals. Coffee and peanut butter? Interesting, I gotta try that!